would have been nice if they could spell her name right! Nicky, I think it's about half way through - Jodie Foster's was in 2013.........hard to know, especially with other surprise stuff. Some of the clues given on th Globes website seem to suggest a few different twists e g Steven Hawking maybe ??? Yeah, I think it is at the end....I am planning to watch the show but it will be very late for me too, so I don´t know what I´m gonna do. So Amal has also her ID cardboard ?? I´ve been thinking about it these days and they finally made it. I just checked and on German TV they will start live the Show at 2am. Oh Boy....I think i will not make it. I hope the red carpet will be way earlier then that. in order to catch up with the show live 9am the next day. Interesting. It's five o'clock in the morning there! 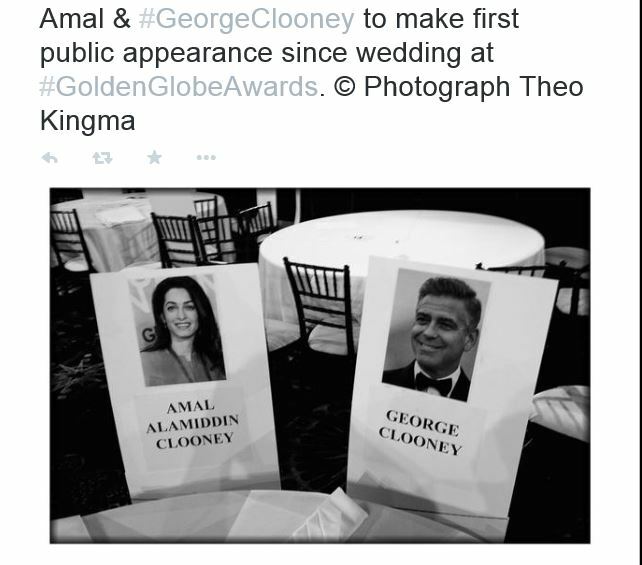 The next mrs clooney wrote: would have been nice if they could spell her name right! Yes....or just print Amal Clooney as she's calling herself now ! i don't think George will even be attending the awards. The previous Cecil B. Award winner does not present the award to the recipient the following year.